On Wednesday 12 of December, the Institute for International Trade welcomed Dr Paula Caroline Zito, Associate Teacher from the Adelaide Law School (University of Adelaide). Dr Zito presented a seminar entitled “Regional Branding of Food Products & Food Geographical Indications”. Geographical indications (GIs) certify that a product has a specific geographical origin and possesses qualities and a reputation that are due to that origin. Focusing on GIs in South Australia, first, Dr Zito pointed out the gap between the GI system for wine, which already exists, and the deficiencies of regulations and laws for regionally rooted food. Then, she raised problems arising from those deficiencies, which affect Australian consumers and producers. From these observations, Dr Zito suggested improving the current Australian legislation, and proposed to implement a food GI legal framework, inspired by the existing system for wine in Australia as well as the Italian GI system. Finally, Dr Zito concluded her presentation claiming that it is important to establish an effective system regulating GIs for food in the context of free trade agreement negotiations with the European Union. After Dr Zito’ s presentation, staff and students from the IIT and from the University of Adelaide participated actively in a discussion. This presentation analyses the current laws and regulations in Australia that regulate the use of Australian regional names on food products to make origin claims. It identifies their deficiencies, and problems resulting from them, for Australian regional food producers and the wider Australian food and agrifood industries. Dr Zito discusses the current regulation of Australian regional names on wine labels in order to highlight the vast differences that exist, under current Australian laws, in the regulation of the use of regional names on food labels to make origin claims, compared to the use of regional names on wine labels, in the form of Geographical Indicators, to make origin claims. 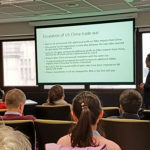 Dr Zito proposes that there is a strong case for the implementation of a sui generis food Geographical Indication framework in Australia in order to overcome the deficiencies identified with current Australian laws and regulations. Dr Zito explains that the proposal for an Australian sui generis food Geographical Indication framework is not only important at a national level, but also equally important at an international level, especially in the context of the recently commenced negotiations with the European Union in relation to the Australia-European Union Free Trade Agreement. Details coming soon, for the upcoming book launch to be held in Sydney, November 2018. 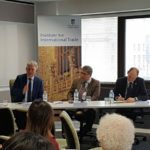 Since June 2018 Australia and the European Union have been negotiating a Free Trade Agreement. This book offers insights from recognised experts in the field, from Australia, Europe and Asia, on the potential economic benefits to be reaped from greater economic openness. It addresses issues of direct relevance to both negotiating teams as well as policy makers, academics, and business leaders across Australia and the European Union.